Two years from now, Apple&apos;s new 2.8 million-square-foot headquarters in Cupertino, Calif., will officially open for business. The company hasn&apos;t been too open with how the experience of working in the headquarters will be for employees, and essentially all we&apos;ve been able to gather of the place has come from this aerial view of the campus, that shows the "spaceship" design of the building. But now, some 20 previously unseen mock-ups of the campus that were hidden in Cupertino’s municipal archive have now been revealed, offering us a glimpse into what the day-to-day will be like for Cook and Co. Apple Campus 2 was designed by architect Norman Foster, who previously built the bullet-shaped Gherkin in London. In the video below, Foster remembers getting a call from Steve Jobs back in 2009, asking him for help. The pair met three weeks later. “One of the most memorable things and perhaps vital to the project was Steve saying, ‘Don’t think of me as a client, think of me as one of your team,’” Foster said. The new campus will fit 13,000 employees in its four-story, $5 billion-dollar structure. It&apos;s not all about gold iPhones and white iPads, though: as you can see from the designs, a great deal of the campus is devoted to green. It&apos;s essentially a huge park, and will include plum, apricot, and cherry trees. It&apos;ll be the other kind of green, too: the campus is supposed to run entirely on renewable energy. Oh, and yes. 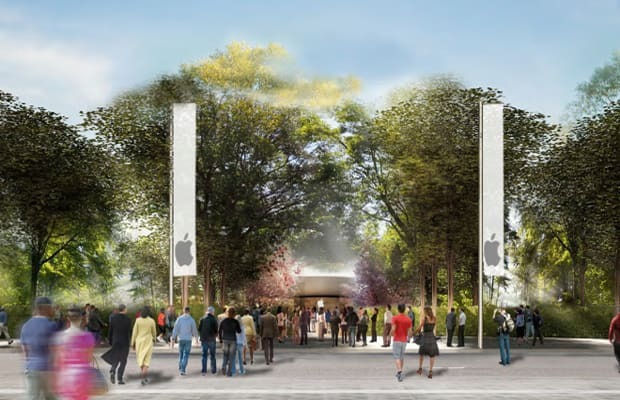 The new campus will have apple trees.